Is LaMelo Ball actually still eligible to play college basketball? LaMelo Ball is headed back to high school. The youngest of the Ball brothers has enrolled at Ohio prep school Spire Institute for what will be his senior season, ending his ill-fated professional career after stops in Lithuania and on his father’s fledgling Junior Basketball League. Ball was introduced at Spire on Friday, being welcomed with a billboard in downtown Cleveland and speaking with reporters alongside his father at a press conference. The presser featured the typical bombastic quotes from LaVar Ball (“since LeBron left, I brought you a Ball boy”), but also included one newsworthy nugget: LaMelo wants to play college basketball next season. LaMelo Ball said he hopes to play college basketball at a top school. Mentioned North Carolina, Duke, Kentucky, Kansas, Michigan State. Ball was once committed to UCLA before dropping out of Chino Hills High School and turning pro. Back then, Ball was considered a five-star recruit by ESPN and was rated as one of the 10 best players in his class. On talent alone, he would certainly have a number of suitors if he was set to play college basketball next season. There’s only one problem: given everything that has transpired with LaMelo since dropping out of Chino Hills, the chances that the NCAA would actually deem him eligible to play college ball appear to be slim-to-none. Though the Ball family is claiming LaMelo never accepted any money during his time in Lithuania and on the JBL, there are still a number of things the NCAA is going to look into should a school decide recruiting him is worth the trouble. In December 2017, shortly after he pulled LaMelo out of Chino Hills, LaVar Ball told ESPN his youngest son had hired 29-year-old agent Harrison Gaines. Gaines also represents Lonzo Ball and LiAngelo Ball. His only other client is former San Diego State star Jamaal Franklin, who plays in China. This should end Ball’s college eligibility on contact, but recent NCAA rule changes might allow for the family to protest. A new rule, at the suggestion of Condoleezza Rice’s Commission on College Basketball, states that high school players may work with an agent provided they have been identified as “elite” by USA Basketball. College basketball players can be represented by an agent beginning after any basketball season if they request an evaluation from the NBA Undergraduate Advisory Committee. Pending a decision by the NBA and the National Basketball Players Association, high school basketball players can be represented by an agent beginning July 1 before their senior year in high school, provided they have been identified as an elite senior prospect by USA Basketball. The effective date will be decided if/when the NBA and the NBPA permit high school students to enter the draft. Expect LaVar Ball to make a big deal about this if a school is serious about recruiting LaMelo. When Big Baller Brand announced LaMelo Ball’s signature sure, the MB1, in August 2017, how it would impact his college eligibility immediately became a talking point. LaMelo was still committed to UCLA at the time, but his father didn’t seem too concerned with NCAA rules. The Balls can claim LaMelo never accepted money to play in Lithuania, but he did sign a contact. At the time, there was speculation that the Ball brothers might not be getting paid anything at all. 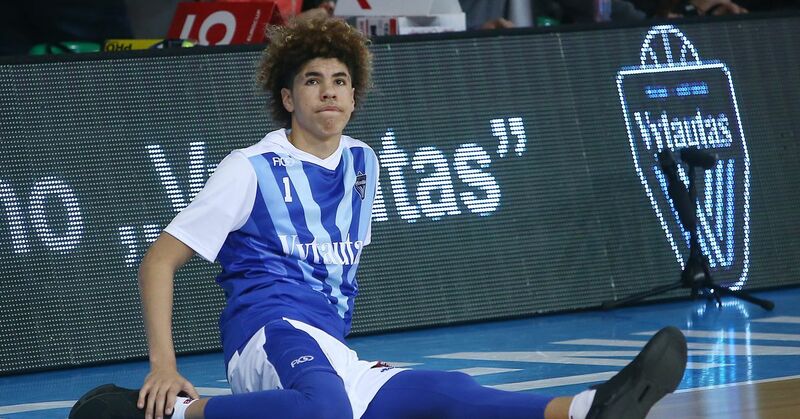 The Balls’ Lithuanian adventure ultimately turned out to be little more than a publicity stunt, but you can bet the NCAA will deeply investigate what actually went down while LaMelo was overseas. There is a ton of smoke surrounding Ball’s college eligibility, though there appears to be enough wiggle room at every stop along the way for his father to mount a loud, public protest in response to the NCAA. Of course, this all becomes a moot point if schools decide Ball isn’t worth the trouble. If that happens? Expect the Ball family to follow the original plan, and have LaMelo train for the 2020 NBA Draft.